A new Transparency Market Research report states that the global field programmable gate array (FPGA) market stood at US$5.48 bn in 2013 and is predicted to reach US$9.7 bn by 2020. It is expected to expand at a CAGR of 8.60% from 2014 to 2020. The title of the report is “FPGA Market - Global Industry Analysis, Size, Share, Growth, Trends and Forecast, 2014 - 2020”.As per the report, rising demand for tablets and smartphones is stimulating the growth of the market. In addition, increasing demand for bandwidth in wireless networks is fuelling the market for FPGA. Increasing fuel prices have resulted in the demand for hybrid and electric vehicles, which will fuel the FPGA content within automobiles. FPGA is broadly utilized in the automotive industry and imaging equipment for enabling great performance computing abilities. This will further augment the growth of the market. FPGA is also witnessing escalating demand in cost-sensitive, space-constrained, and low-power applications. Rising usage of FPGA for financial data processing is a great opportunity seen in the market that may also fuel the growth of the FPGA market. On the other hand, DSP, ASIC, and ASSP are being utilized in place of FPGA in some of the application areas. This may impose a negative effect on the growth of the market for FPGA in the coming years. The report segments the market on the basis of type, application, and geography.On the basis of type, the market is segmented into static random access memory (SRAM), antifuse, and flash-based. Amongst these, the predominant share was taken by SRAM in 2013 and this segment is expected to maintain its superiority all through 2020. This is due to the fact that FPGAs that are based on SRAM exhibit high radiation tolerance due to which they are being greatly utilized in aerospace applications and also due to the rapid in-circuit reconfiguration exhibited by SRAM. On the basis of application, the FPGA market is segmented into consumer electronics, automotive, industrial, military and aerospace, data processing, telecommunication, and others. Amongst these, the telecommunication segment emerged as the biggest application segment in 2014. On the other hand, the aerospace industry will be using FPGAs extensively in wireless and imaging sensors.On the basis of geography, the market is segmented into Europe, North America, Asia Pacific, and Rest of the World (RoW). 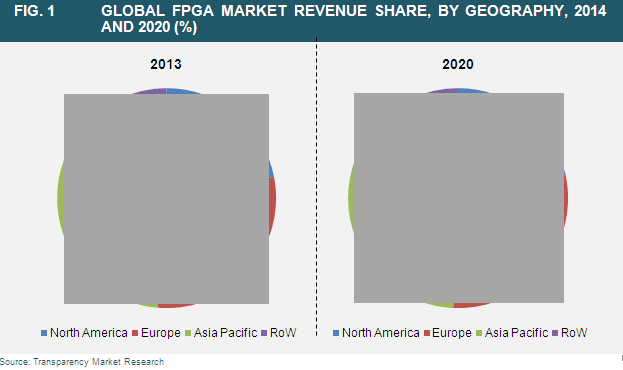 Amongst these, Asia Pacific led the global FPGA market in 2013. The reason for the dominance of this region is the robust electronics industry in countries of China, India, and South Korea, where some of the top FPGA players operate.As stated in the report, the prime players operating in the market for FPGA include Xilinx Inc., Altera Corporation, Lattice Semiconductor Corporation, and Microsemi Corporation, among others.